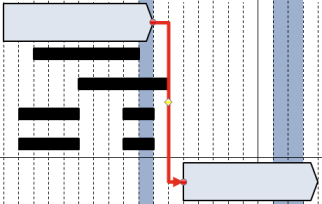 How to add link lines (a.k.a dependency lines) in Gantt charts? think-cell does not offer an extra feature to add link lines (a.k.a. 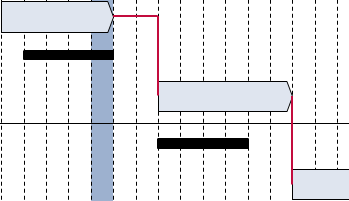 dependency lines) to Gantt charts. Please use the think-cell universal connector or a PowerPoint connector like the Elbow Arrow Connector. You can insert a think-cell universal connector by clicking on the button in the think-cell toolbar and attach the connector to the ends of bars or processes. To obtain a right-angled connector drag on the handle in the middle of the connector. The connectors will automatically follow the objects they are attached to, when the latter move. For more information refer to section Universal connectors of the user manual. Office 2003 and earlier: Display the Drawing toolbar, then click on AutoShapes → Connectors → (Ellbow Arrow Connector). Office 2007 and later: Click on Home → Drawing → (Elbow Arrow Connector). In Office 2007 and later, PowerPoint connectors can be attached to think-cell Gantt objects like bars and processes. They will automatically follow the objects they are attached to. The connection points on the think-cell objects to which you can attach connectors appear as red dots.